This past weekend's disgusting display of brutality and violence once again on the streets of Cairo, sadly has left the world a much emptier place. On the street where people were inhumanely beaten dead or unconscious with sticks and raw boots to the head, an historic building containing some of the world's great treasures burned helplessly. The building, the Egyptian Insitute, was founded by Napoleon Bonaparte during the French Campaign in 1798. It housed 200,000 books and documents, of which an estimated 40,000 were rare manuscripts including an original copy of the ‘Description de l'Egypte’ written by the scientists of the French campaign to Egypt (1798-1801). All lost to humanity, thanks to a molotov cocktail. Tragic fires can happen anywhere in the world as can riots as was witnessed on the streets of London this past summer. But thousands of miles away from the flames that obliterated more of the world's important historical heritage in Cairo, the bust of Nefertiti, the Rosetta Stone, the Elgin Marbles and other priceless cultural objects were safe and sound. But clearly, future generations are best served when cultural patrimony is not concentrated in any single country. Click here for an account of the fire in Egypt. It was called the Greatest Sale of the New Century but it proved to be one of the most memorable -- and successful -- of all times. The Collection of Yves Saint Laurent and Pierre Berge, sold February 23 - 25 by Christies Paris, was more than the dispersal of a great assembly of objets d'art, it was a grand test of the health and sustainability of the art market. More than 733 lots were lavishly described in French and English in the catalog which itself was a tour de force -- nearly 2-inches thick and weighing a whopping 8 pounds! Many objects consumed multiple full-color, multi-fold pages. No marketing effort was spared to chase buyers for this sale but the question was whether would buyers chase the objects as fervently or would they merely be pecking for bargains. At the auction's conclusion, The Art Newspaper, the insiders periodical to the art market, victoriously proclaimed "Yves St Laurent sale smashes records despite global financial woes" in reporting the event's results. The sale generated nearly half-billion dollars (more than double pre-sale estimates) with all but a miniscule handful of lots selling. More importantly for readers of this blog, the antiquities section of the sale -- 10 lots in all -- actually out-performed the auction overall delivering a whopping $3M in aggregate, which was nearly 400% of the low estimates total of $786K. 687. Was a 17-inch Roman marble toros dating from the 1st-2nd Century AD. This type, with musculature indicating a contrapasto attitude, is generally referred to as a later derivative of the Greek sculptor Polykleitos. The surface was pocked, but not overly cleaned. At 46,600 Euro (est 40-60k Euro), this was the antiquities 'relative bargain' of the day. 688. An Attic red-figure krater, about 10.5 inches high, with a standard and otherwise unremarkable scenes of three females except that two were playing instruments. The seated woman was playing the lyre and one standing behind the the double aulos (a type of flute) and the third woman was holding a box and scroll. The reverse featured a typical genre scene. Dirty surface and old repairs did not deter a buyer from paying 145,000 Euro (Est 15-25k Euro) nearly 10x the low estimate. As a comparison, a similarly dated Attic krater with a far more unusual Athenian patriotic scene from a 1970s Swiss collection sold in NY in December 2008 for $23,475. 689. A 23-inch Roman spiral-fluted marble colum shaft from the 3rd-4th century brought a hefty 85,000 Euro (Est10-15k), most likely for its decorative appeal rather than its art historical value. 690. A 12-inch Roman marble head identified as Diomedes, the mythical King of Argos from the Trojan War, dating from the 2nd Century AD was sensitively carved but the proper right side of the face was damaged and stained. Still, it achieved 3.5x the low estimate bringing 145k Euro (Est 40-60k Euro). 691. Wonderfully carved wooden Egyptian anthropoid sarcophagus lid standing 80-inches tall and acquired by St. Laurent in 1975 from a Parisian dealer, was a relative bargain at 313,000 Euro (Est 50-70k Euro). 692. An Egyptian Late Period 9.25-inch bronze figure of a striding Mahes (the relatively rare "savage lion" deity) had an esitmate of 15-20k Euros, and achieved a remarkable 49,000 Euros despite missing its left foot and a rough surface patina. 693. This was the stunner of the antiquities portion. A lovely, large Greek black-glazed hydria from South Italy and dating to about 350 BC. The propotions, as is typical of the type, exude femine grace and beauty. Carrying an already ambitious estimate of 15-20k Euros, buyers fought over the object until it was hammered down for a surreal 253,000 Euros. 694. This 33-inch Roman marble torso of Mercury dated to the 1st-2nd century AD topped its presale estimate of 150-250k Euros by bringing a staggering 481k Euros. 695. Arguably the rarest of the objects in the sale was this Roman marble statue of a bull-headed man (Minotaur) that stood scarcely taller than a yardstick and once decorated St. Laurent's outdoor garden. Estimated at 300-500k Euros, the winning bid was just shy of 1-million Euros. 696. The final antiquities lot was a dimunitive 11-inch torso of a Roman athlete estimated at 20-30k Euros and eventually hammered down at 97k Euros. With the exception of the Minotaur and the Sarcophagus Lid, the balance of the antiquities lots were quality objects but hardly the rarest or most exceptional examples of their type. The pomp and frenzy of the sale carried overtones of the Jackie Onassis auction held in NY several years ago. Bidders' eyes were struck by the aesthetic appeal of objects generally obtainable at significantly lower prices in the general art market, but were bllinded to relative values as the most persistent fought to pay whatever it took to own a piece of the Saint Laurent aura. And the fact that the objects had published provenances from the 1970s and 1980s proves that provenance is valuable, but aura is priceless. What Does the Ancient Coin Market Portend for Antiquities? Against the backdrop of a deepening financial crisis, December was a record shattering month for the antiquities market. Now, nearly two months later, what do we know about the direction? Unfortunately, until we get further in the spring season with major fairs across Europe, there is little new direct data on the antiquities market. However, we do have some very interesting news coming out of the ancient coin market that could offer a barometer. Specifically, I'm referring to the fifth annual Gemini Sale which took place in New York in January in conjunction with the annual New York International Numismatic Convention. Timing couldn't have been worse. The lingering financial crisis, the holiday hangover effect, a pre-emptive missive by Dutch journalist Arthur Brand asserting that one of the star coin lots was a fake, and the bitter cold temperatures in the Northeast all conspired into a perfect storm that in other times might have dampened collectors' enthusiasm and their budgets. Despite all, activity was brisk and dealers pleased. The 905-lot ancient coin auction was a major success ringing up over $3.7M including buyers commission. Observers and dealers at the event declared confidently that there is no evidence of a downturn adversely impacting the ancient coin market. In fact, Peter Weiss, treasurer of the American Numismatic Society, was quoted in press reports as saying "All nice-condition ancient coins have doubled in value in the last 18 to 24 months." Like antiquities, aancient coins have come under tighter import/export scrutiny in recent years. Provenance has also become a more element affecting the overall value of an objects. The similarities between the ancient coins and antiquities markets suggest that both remain somewhat insulated from the speculation that drove more popular areas of the art market. It may also suggest that collectors understand that in a global highly specialized market like antiquities and ancient coins which is fueled by growing scarcity, opportunities to acquire great objects in every price range are fleeting. It is with deep sadness that we report the passing of Cornelius C. Vermeule, 82, who we lost on Thanksgiving Day in Cambridge, MA. Cornelius was born August 10, 1925, in New Jersey. From 1953 to 1955 he taught fine arts at the University of Michigan. From there he moved to Bryn Mawr College as Professor of archaeology until 1957 when he was appointed curator of classical collections for the Museum of Fine Arts, Boston. He married a Bryn Mawr student, Emily Dickinson Townsend Vermeule that same year. While at the Museum, he also lectured at Smith College. Cornelius assumed the directorship of the Museum of Fine Arts in the 1970s. His term as curator was marked by purchase of two large vases portraying the fall of Troy and the death of Agamemnon, a Roman portrait of an old man, and a Minoan gold double ax. He trained several curators including Marion True formerly of the J. Paul Getty Museum and Carlos Picon of the Metropolitan. "During his forty years as Curator of Classical Art at the MFA, no one did more to promote appreciation of Classical culture than he, or did so in such a lively and engaging way,” said J. Michael Padgett, Curator of Ancient Art at Princeton University Art Museum who worked under Cornelius at the MFA from 1986-1990. Even in retirement, Cornelius remained extremely active as an author of a detailed series of articles in ancient numismatics for The Celator and occasional articles for Minerva. But for those who knew him, some of his most popular writings were the postcard notes he was fond of sending to friends, former colleagues and ex-students. Over the years, I received a number of such postcards, each documenting his generous blend of encyclopedic expertise and irrepressible humor and wit. Once, in an exchange of letters we were having regarding an important object we had just acquired, I made a number of observations about the Prima Porta Augustus statue in the Vatican and drew parallels to our acquisition. In his next postcard, Cornelius humbly joked that I knew a lot more about the Prima Porta than he did, then proceeded to make several insightful comments that could only come from someone of his intellect and span of knowledge. I kept this postcard and every postcard from Cornelius. Read the obituary in the Boston Globe. Plans have surfaced in the press regarding ambitious plans for the rebuilding of the Temple of Artemis - one of the original seven wonders of the world at Selçuk, near the port at Izmir, in Turkey. The Temple of Artemis, or Artemision in Greek, recalled in both Greek and Byzantine anthologies for its magnificence, was once one of the Seven Wonders of the World. After decades of vandalism, religious conflict and decay it is finally to be rebuilt at a cost of $150 million. According to Altinkum's Voices newspaper, Dr. Atılay İleri, the founder of the Selçuk Artemis Culture, Arts and Education Foundation, met with Dr. Anton Bammer of the archaeology institute at the University of Vienna, Austria, a decade ago while Dr Bammer was leading a series of excavations in the area. During this period, experts searched for the techniques on how to rebuild Artemis. The original Temple of Artemis had 120 columns. Thirty-six of them were placed on cubic circles. If completed, the new temple of Artemis will be the third Temple of Artemis constructed in history. Its size will be the same as the original. A total of 25,000 cubic meters of solid marble, the original construction material of Artemis, will be used in the construction of the third temple. Sixty of the 120 columns of the new temple will have base plates. 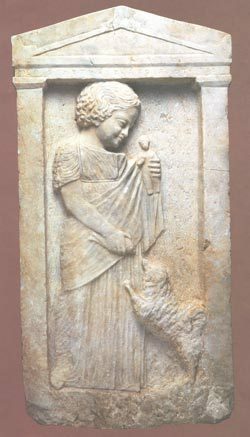 Erected at the expense of the Lydian king, Karun, at Ephesus (modern-day Turkey) in the seventh century B.C., the Temple of Artemis was dedicated to the goddess Artemis, or Artemis of Ephesus, the daughter of Zeus and twin sister of Apollo. She was the Hellenic goddess of forests, hills, virginity and fertility. A young lifeguard swimming near Palmachim beach south of Tel-Aviv discovered a rare marble discus, known in Greek as an ophtalmoi, dating to 5th Century BC. according to reports out of Israel tonight. The 20cm discus, which would have been fastened to the hull of an ancient ship with a bronze nail, was a good luck token that represented the pupil of an eye and would have adorned a combat or cargo ship. To date, only four such items have been found in the world – two of them here in Israel, one recovered from the Mediterranean Sea off the coast at Carmel in addition to this one at Yavne-Yam, according to the Israeli Antiquities Authority. Click here for the full story in Arutz Sheva and more photos. Wine, Worship, and Sacrifice: The Golden Graves of Ancient Vani, the inaugural exhibition at the Institute for the Study of the Ancient World at New York University, features spectacular finds from four graves excavated at Vani, a major administrative and religious center of ancient Colchis (present-day Republic of Georgia) and the setting for the myth of Jason and the Golden Fleece. The exhibition, which opened in March, concludes its run on June 1. More than 100 objects from these graves, which date from the fifth and fourth centuries B.C., are on display and include an impressive array of locally produced jewelry as well as imported goods from its Greek and Persian neighbors. Together, these objects create a clear picture of Vani as a crossroads city, providing compelling testimony to the complex interrelations that occurred in this region throughout its rich history. Click here for exhibition highlights, conference information, and directions. Hours: 11 a.m. - 6 p.m. | Friday: 11 a.m. - 8 p.m. | Closed Monday. In an age of newsbytes, youtube, and Britney Spears, it is easy to despair over the state of our cultural health. Popular taste seems a never-ending obsession with the temporal and the inconsequential. One wonders whether at the current pace, our appreciation for the classical heritage that lives at the root of modern society will wane from the distraction. At least one data point offers hope. On February 21, the one-millionth visitor walked into the newly renovated galleries of Greek and Roman art at the Metropolitan Museum. That's a fairly impressive showing since the galleries were opened to the public just 10 months ago. On average, more than 3,700 people daily walked through the marble sculpture gallery, or more than one out of every four that entered the Met. 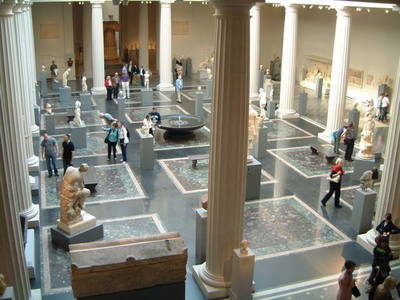 The Met's galleries house one of the finest assemblages of Greek, Hellenistic, Etruscan, South Italian and Roman art collections in the world. The new galleries doubled the number of objects on public display, including 5,300 objects that were gratefully removed from storage. The centerpiece of the new galleries is the majestic Leon and Shelby White Court - a monumental, peristyle court with soaring two-story atrium bathed in natural light. In an era when the classical collections in some museums have been delegated second-tier status in money, resource and attention to more sensational exhibits, it is worth hoping that perhaps the Met's success with spark a new, more widespread revival in the classical past. U.S. venue of the traveling exhibition, which was previously shown in Amsterdam, Athens, Basel, Copenhagen, Hamburg, Istanbul, Munich, and Rome. A closer look at the surfaces of many ancient statues and reliefs reveals traces of their painted decoration, suggesting that plain white marble sculpture was not so much an ancient reality as an invention of the Renaissance and neoclassical periods. Evidence of painted and gilt stone sculpture, of colorful bronze statuary, and of statues of gold and ivory puts Greek and Roman art in harmony with artistic practices in Egypt and the Near East, and with those of the subsequent medieval period. The color reconstructions presented in Gods in Color are based on extensive visual and scientific analysis of original sculptures. Two short films that document the process of their creation and a display of pigments used in antiquity—as well as for the modern reconstructions—will also be shown in the galleries. More information. Roadworks in southern Greece have unearthed a rare Mycenaean grave thought to be well over 3,000 years old and containing important burial offerings including a gold chalice, according to a report from Reuters today. Archaeologists said it appeared to be the grave of a local military official and was the first time a single grave had been found with such a combination of objects -- including a bronze and gold sword, and a bronze spear point, knife and pot. Pottery found in the grave dated it to around 1,200 BC. For the full story via Reuters click: Mycenaean grave.